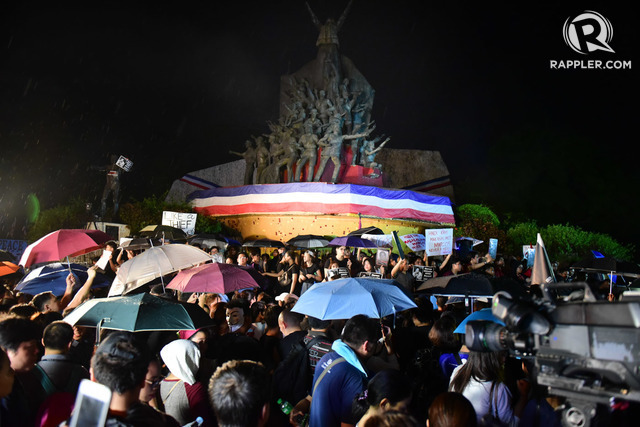 Led by several organizations of various political affiliations, the demonstrators came from various points in Metro Manila, where some of them mobilized as early as noon, upon receiving news that the dictator had been laid to rest at the Heroes’ Cemetery in Taguig. 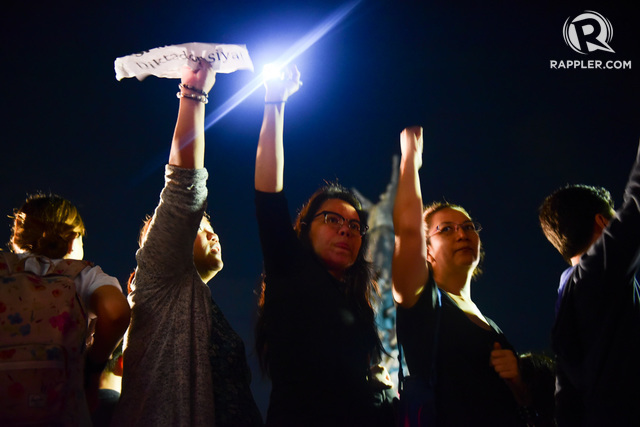 The #BlockMarcos Movement, which is also coordinating with Camb, planned to troop to the Heroes’ Cemetery on November 30, to stage an Occupy Libingan ng mga Bayani protest. Former Bayan Muna Representative Neri Colmenares said they are still studying whether they will file a motion for reconsideration before the Supreme Court. He was the lead counsel for one of the petitioner groups that lost their bid to stop Marcos’ burial at the Heroes’ Cemetery. 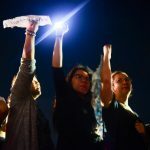 “Dapat siya managot kasi siya naman talaga ang nagbigay pahintulot at nag-encourage na ilibing si Marcos sa Libingan ng mga Bayani,” Ellecer Carlos of human rights group iDefend said. 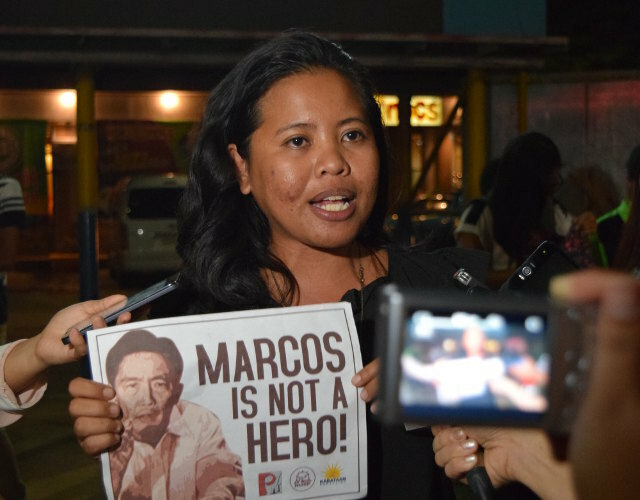 “But for sure, we are really disappointed at the support the administration has given [to the Marcoses], and, of course, they have to be held accountable,” she said. 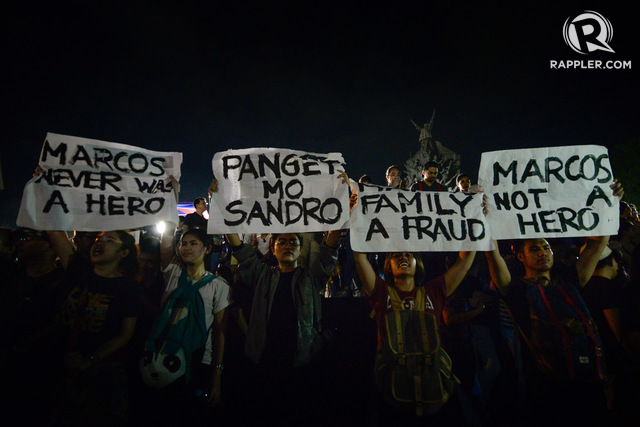 In Bacolod City, Negrenses joined the nationwide protest against a hero’s burial for Marcos by holding a rally at the Fountain of Justice. 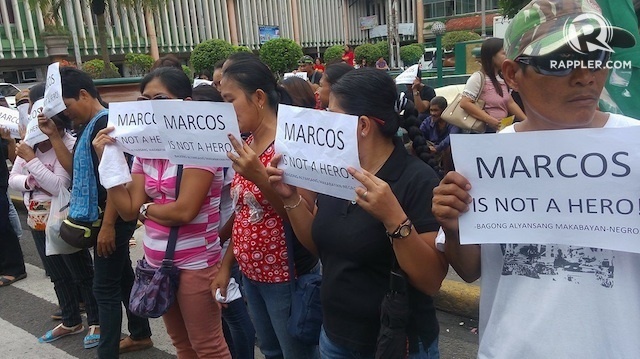 “Malinaw na itong rehimen natin sa kasalukuyan ay hindi nagsisilbi sa ating mamamayan kung saan ipinamumukha sa atin itong pagbulaga na paglilibing kay Marcos na hindi pinaalam sa atin, na pambabastos sa ating kasaysayan,” said youth leader Ronces Paragoso. “Marami ang naging biktima ng human rights violations, torture – mga desaparecidos na ilang taon na ang nakararaan ngunit hanggang sa ngayon ay hindi pa rin nabibigyan ng hustisya,” she added.